If you’d like to spend less time in the doctor’s waiting room, three Lynchburg students and their marketing professor are on your side. And you may want to cheer for them in a statewide innovation competition this week. Niko Louvros ’21, from Manassas Park, Virginia; Claudia Lopez Perez ’22, from Madrid, Spain; and Stephanie Quaranto ’21, from Warwick, Rhode Island, are semifinalists in the American Evolution Innovators Cup, a contest challenging college students to develop business ideas and solutions to social issues. They will pitch their product idea Friday morning, along with more than 40 other semifinalist teams from 17 universities. They’re in the running for prizes that total $60,000. 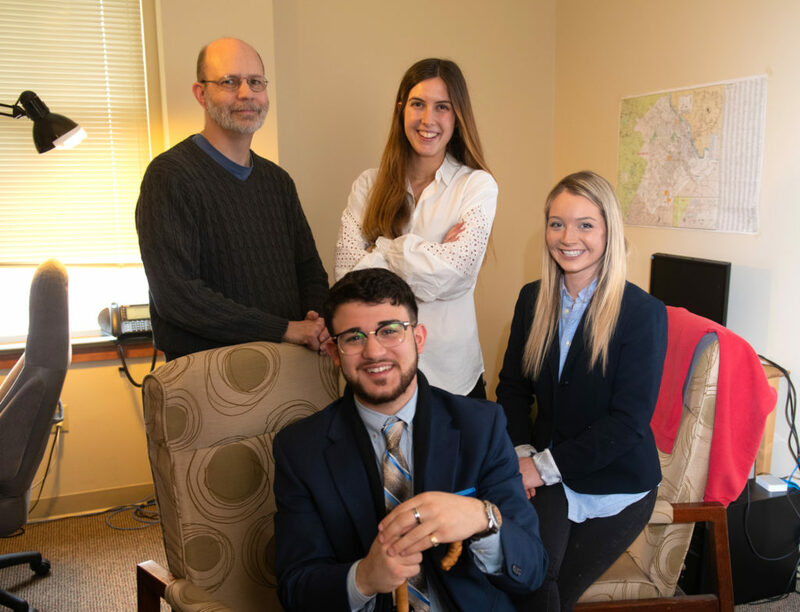 Led by Dr. Stef Nicovich (right), the Lynchburg team in the American Evolution Innovators Cup includes Claudia Lopez Perez, Stephanie Quaranto, and Niko Louvros. Their idea came about one day when marketing professor Dr. Stef Nikovich had a doctor’s appointment. After several hours in the waiting room, he started thinking there must be a good way to reduce those wait times. During his drive home, he thought of one. “I decided I’d put a team together to work on it,” he said. He recruited students from an entrepreneurial club he advised. All of them have interest in different sides of business. Between the three of them, their majors and minors include financial economics, marketing, graphic design, accounting, and statistics. They are looking for students who could lend programming or hardware expertise. After the team met a few times, Dr. Nancy Hubbard, dean of the College of Business, asked them to represent the University of Lynchburg in the Innovators Cup. The application deadline was only about two days away, so the team put in a lot of hours to develop a video and slideshow to pitch the idea. Then they got invited to the competition. They don’t want to share the details of their proposal publicly quite yet, but they said it would use technology to more accurately schedule appointments. They’re looking forward to seeing how it compares with other ideas college students are developing. Dr. Nicovich is proud that his students have invested time into making a clear case for the idea. “I think it’s a phenomenal thing, especially for them to go up there and present, and be a part of something that’s more than just presenting in front of a professor in a classroom,” he said.